It’s tax season! Choose to invest in this dark horse to enjoy the tax benefits along with generous returns. L&T Tax Advantage Fund is a true multi-cap fund managed by an immensely experienced fund manager along with the various other schemes. Mr. S. N. Lahiri has been taking care of this since the time L&T took over this fund in 2012. This tax-saving fund was launched by Fidelity Mutual Fund in Feb 2006. A multi-cap tax-saving fund is the jack of all trades. Being an ELSS fund, it gives tax deduction benefits on the investment under Section 80C of the Income Tax Act of India, 1961. And being a multi-cap scheme confers an advantage of enjoying the growth stories played out across all sectors and all sizes of companies. Investing in equity always includes some kind of risk, but the 3-year lock-in period of this fund helps the investors to tide over most of the short-term fluctuations of the capital market. What Does the Past Performance Say? L&T Tax Advantage Fund was one of the very popular products of Fidelity’s basket that witnessed a downfall due to the transition of the fund house and probably the change in the fund management strategies. But this degradation from 4-star rated performer to 2-star did not last long. Since the last 2 years, the fund rebound to show pretty good returns under the 20-year experience and skilled guidance of Mr. Lahiri. The dip in the performance of this ELSS Fund during the transition years (2012-2015) was momentary; otherwise, it has demonstrated beneficial results and has consistently beaten its benchmark index (BSE 200). The fund has managed to outshine both its category and the benchmark even during the bear markets of 2008 and 2011. Tracking the similar trend, the fund’s performance was par excellence in 2010. What Has Brought This Fund Back to Performance? The investment style of the fund manager!! Under Mr. Lahiri’s distinct investment style, the fund portfolio reflects high-conviction stock choices. Conforming to the bottom-up style, the team has chosen to invest around 56% in the large-cap in order to minimize the volatility risk factor. The scheme has maintained a diversified portfolio spread across the fundamentally strong and scalable businesses with trustworthy management track record. It is set free to invest in any sector or capitalization and harness the viable opportunities prevailing in them. The reason this fund has regained its track to generate 41% of turnover since the last 2 years is that the L&T Investment Management has continued to regulate it the same way as Fidelity does. "Because that is how the scheme was sold to investors back then," said Lahiri once. As soon as Mr. Lahiri got the charge of the fund, he tried to make the portfolio tighter and dropped some of its holdings. Going by his experience, he reduced the scheme’s exposure to the real-estate stocks and increased the allocation in auto ancillaries, power, and distribution sectors. 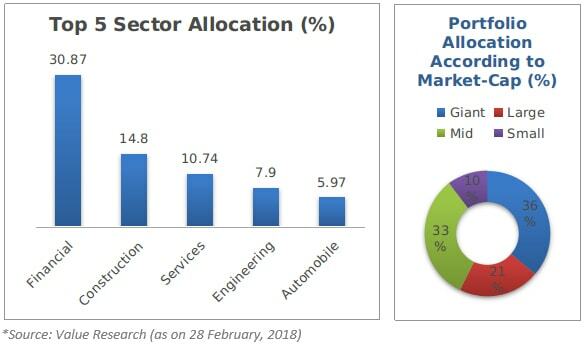 As per the present scenario, the portfolio is skewed towards the private banks and financial companies. Mr. Lahiri thinks that private sector banks are in better position to capitalize on the economic recovery. The scheme is also overweight in the construction sector as some of the businesses in this industry are anticipated to benefit from the government's expenditure plans in the infrastructure sector. How Does this Scheme Avoid Risk in Comparison to Peers? The past portfolio structure of the scheme suggests the fund manager typically avoids taking aggressive cash calls. The scheme does not invest aggressively in small & mid-cap stocks, given the typical low risk profiles of its investors. During 2014-2015, the scheme went against the stream and lost the chance to enjoy high returns from the small and mid-cap stocks. But this strategy has avoided the fund to deviate from its returns even during the short disruptions of the market and proved to be beneficial later on. 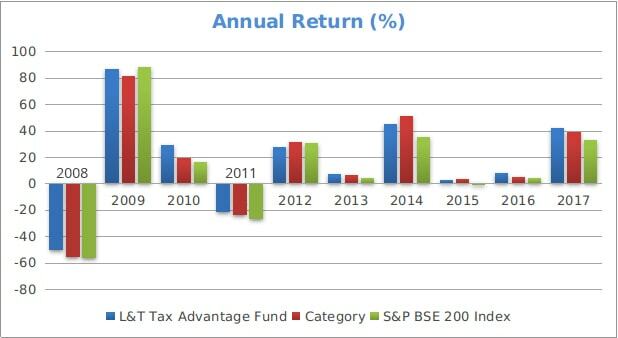 Relative to the other funds in the category, L&T Tax Advantage Fund slipped from its performance but was convincing enough throughout its harsh times. It remained in the eyes because of its diversified portfolio and effective management. And the ones who kept patience and conviction towards its qualitative parameters have eventually yielded substantial returns. This fund can be apt for the one who anticipates high return with moderately low risk tolerance in the long run. Stay connected to MySIPonline for more information and recommendation related to the mutual funds.